The team of astronomers, led by Andrew J. 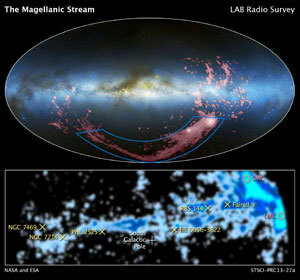 Fox of the Space Telescope Science Institute, determined the source of the gas filament by using Hubble’s Cosmic Origins Spectrograph to measure the amount of heavy elements, such as oxygen and sulfur, at six locations along the Magellanic Stream. They observed faraway quasars, the brilliant cores of active galaxies, that emit light that passes through the stream. They detected the heavy elements from the way the elements absorb ultraviolet light. Fox’s team found a low amount of oxygen and sulfur along most of the stream, which matches the levels of the Small Magellanic Cloud when the gaseous ribbon is thought to have formed. In a surprising twist, the team discovered a much higher level of sulfur in a region of the stream that is closer to the Magellanic Clouds. “We’re finding a consistent amount of heavy elements in the stream until we get very close to the Magellanic Clouds, and then the heavy element levels go up,” said Fox. “This inner region is very similar in composition to the Large Magellanic Cloud, suggesting it was ripped out of that galaxy more recently.” Because these abundances can be measured only in ultraviolet light, which Earth’s atmosphere absorbs, the observations can be done only by the Hubble Space Telescope. Unlike other satellite galaxies of the Milky Way, the Magellanic Clouds have been able to retain their gas and still are forming stars because they’re more massive than the other satellites. However, as they’re now approaching the Milky Way, they’re feeling its gravity more and also encountering its halo of hot gas, which pushes their own gas out. That process, together with the gravitational tug-of-war between the Magellanic Clouds, leads to the production of a stream. Ultimately, the gaseous stream may rain down onto the Milky Way’s disk, fueling the birth of new stars. This infusion of fresh gas is part of a process that triggers star formation in a galaxy. Astronomers want to know the origin of that wayward gas in order to more fully understand how galaxies make new stars. The team reported its results in two papers that appeared in the Aug. 1 issue of The Astrophysical Journal. Photo: These companion images show wide and close-up views of a long ribbon of gas called the Magellanic Stream, which stretches nearly halfway around our Milky Way galaxy. Originally published by Marissa Gebhard at news.nd.edu on August 08, 2013.